CROSBY– Fifty three brightly decorated booths, colorful entertainment and eager business representatives greeted over several hundred consumers at Crosby High School commons last weekend. Swamping the Business to Consumer Expo on Saturday morning, over 350 local folks participated in drawings for door prizes. 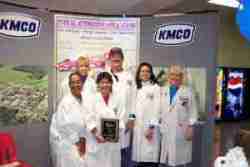 KMCO took top honors as the best representative of their business with lab coats, a state of the art back exhibit, and some great delicacies to snack on. Lee College had the “Best of Theme” booth, with its international flag display. Polls are open 7 am to 7 pm. Voters can find their Precinct number by checking the upper corner of their Voter Registration Card. HUFFMAN– Steven Myers, Superintendent of the Huffman schools, announced that the Board of Trustees approved an order calling for a “Schoolhouse Bond Election” in the amount of $19.8 million dollars. The election is scheduled for December 7, 2002. The district long-range planning committee will be preparing detailed information regarding the bond election, and scheduling meetings to inform staff, parents, and community members. Additional information is available by calling Myers at 281-324-1871, ext. 106. Well, it looks a whole lot like a wet winter (again). I wish someone would find out how to turn that thing off! Anyway, I think we all breathed a sigh of relief when they caught those sniper guys. Its a shame it took so many lives. Dont forget that its only a little over a week till were campaign commercial free! Shouldnt there be a holiday for that or something? Speakin of them politicians, did you hear about the politician who was kissin babies and the mothers washed the babys mouths out with soap?! Im not sure who to believe anymore. The Democrats tell us how mean the Republicans are and to vote Democrat. The Republicans tell us what scoundrels the Democrats are, so vote for Republicans. The Independents tell us that everybody is crooked but them. Well, it makes a decision so tough, when all of them are tellin the truth! I had somebody tell me maybe I should lighten up on poor ole Bill Clinton and his cronies. I told them that I would, but Bill wont leave the stage. He keeps trying to stay in the spotlight. So I politely told them, I really believe that you all read my ramblins because I dont say what everyone else says, I just say what everyone else would say, if given the chance! Now, if Im wrong on this, please write and let the Star Courier know. Speaking of the Star Courier, how about the new website? It is really nice. Check it out at www.starcouriernews.com. (By the way, they will eventually get around to changing it for each week, I promise). This weekend, I will be down in beautiful George West Texas for their Storyfest. Its a long way down there, but it is probably the single best event of its kind in Texas. There will be storytelling, ghost stories, poets, a working chuckwagon, games, music and a lot of other stuff for the kids and adults. Im going to keep tellin you all about these things until some of you attend. These are great family weekends that are free admission. The second weekend in November is the Egypt Plantation Days in Egypt, Texas. Yes, Virginia, there is an Egypt, Texas! Another free event with something for everyone. Egypt is just ten miles North of Wharton, Texas. Try this one, too! I guess Ive never come right out and said it, but you might stick your ole head into a local Crosby church service on Sunday. There are a bunch of good ones around and one of em will fit you, Ill guarantee. You might even like it! What a week. It seems that the whole world is tipping over on its side. Theres a gunman loose in the Washington/Virginia area and everyone is staying home, not even shopping for groceries! The economy in that area is down millions of dollars and the nut is still runnin loose! How about putting a BIG reward out for this guys capture, say, $1,000,000.00? I betcha that would get him caught real quick like. And, if all else fails, we may just have to settle it by sending them a Texas Ranger. End of story. Have you heard the latest from Panic World Headquarters? North Korea has deliverable nuclear weapons. DUH!!! Guess where they got the technology to build accurate missiles for those nuclear weapons. Well, its spelled B-I-L-L C-L-I-N-T-O-N. Slick sold them the technology so he could finance his campaign. Then he made sure nothing would be done about it by appointing Her Majesty, Madeline Allbright sic (theres a great last name for ya! ), as Secretary of State. North Korea promised to play nice and she believed em! Now Korea is ready to move and everyone is saying its Bushs fault! Sorry, guys. Some of us have been following this thing and know whats goin on. Everyone else is just now startin to see the mess that went on in Washington during Slicks stay. The scary part is, how much more damage is yet uncovered? On the cheerier side, the election season is almost over. Can Thanksgiving be far behind? Is it a coincidence that Thanksgiving quickly follows the elections? Just be sure and vote, especially for the governor. Im having trouble deciding which scoundrel to vote for. Is it still legal to vote for my favorite candidate, None of the Above? A little note to the boys who do the grate cookin at Larrys on Thursday nite: I love you guys! Just keep them steaks juicy! I got to entertain about forty Japanese visiting Tyler on Saturday. What a great time! They spoke little or no English and I spoke only two or three phrases of Japanese. However, when I spoke cowboy, they understood instantly. They knew the words and music to Happy Trails, and sang right along. I taught them the words to Back In The Saddle Again. No problem. Then they wanted their pictures taken holdin my antique Colt pistols, usually pointed at me! You see, in Japan, they cannot own firearms of any kind, so they have a real fascination with guns. One really nice guy informed me through the interpreter that he was a black belt. I said I was a good shot. He then said he would stop the bullet with his sword. I said, bang, bang, bang! He said, I now dead! These folks were very courteous and polite. Some were flat out funny, like that guy. We all enjoyed each others company. What was the common bond though, was the cowboy spirit, which they loved and identified with so well. I guess the American cowboy is still one of the best good will ambassadors we have, and Lord knows, we need them now, more than ever. So this week, if you see a cowboy, tell him thanks. Hell know what you mean! Shut the gate on your way out, pard. Crosby- With the Crosby looking to keep their district record perfect, the Cougars traveled to Crenshaw Stadium in nearby Sheldon. Despite a valiant effort, the Cougars lost 35-28. During the soggy evening, the Cougar rushing game could only muster 88 rushing yards, Cleveland Archie having 68 of them. Quarterback, Kellen Haynes was 15-31 for 231 yards with no picks. King quarterback, Jeremy Hearne opened the scoring with a 70-yard run with less than two minutes having passed in the first quarter. Crosby answered with a 19-yard pass from Haynes to Chris Destin. Crosby tight end, Chad Coltharp then caught a 20-yard pass to put the Cougars ahead 14-7 at the end of the first quarter. Crosby would not have the lead again. The Panthers scored 13 points in the second quarter to Crosbys 0, and went into the locker room with a 20-14 lead. King scored first in the second half, after recovering an onsides kick. Then Crosby stormed back to knot the score at 28-28, with twelve minutes left to play. The Panthers scored in the opening minute of the fourth quarter, and held the Cougars scoreless for the remainder of the game, to come away with the win. 6-2,2-1 Crosby will travel to Forest Brook on Friday to face the 3-4,2-1 Jaguars in an important District 21-4A game. The game is at 7:30 PM on November 1st. Horsefeathers is refreshing. We need to share this Cowboy. While surfing the net, I came across your site and loved this column. It is refreshing to read a column where the writer is a true American Cowboy through and through and not afraid to voice his opinion. Is his column in any other newspapers? If not, it surely needs to be as everyone would enjoy this fresh way of looking at the world. Thanks for sharing this column on your site. CROSBY– The Oct. 4 bye week for Crosby didn’t seem to hurt the Cougars as they scored three touchdowns in a 27-3 victory over Galena Park in their district opener. Crosby’s defense played heavily in the win, completely stopping the Yellow Jackets’ passing game (O for 2 with two interceptions). The defense was also the ones to put the Cougars on the board first. Three minutes into the game, Michael Garcia recovered a Yellow Jacket fumble in the endzone for a touchdown. Crosby forced three turnovers on fumbles in the game.